Today I'm taking a day to rest and catch my breath. It's been one thing after another since I got home from Vancouver, and I'm tired. Very tired. As you may have seen in my tweets in the sidebar, my Uncle Jim Beamish died on November 9. He was relatively young and his death was a bit of a shock to all of us, including his big sister--my Mom. My first thought was to drop everything and head out to Manitoba with my Mom, but I still had my cough and so much catching up to do, so I rationalized that I didn't need to go. Well, that lasted two days. I decided that I would drive out to Manitoba, where Jim had lived, with my Mom for the funeral. From Fort McMurray, with a stop to pick Mom up in Edmonton, it would be about a 19 hour trek. No problem--we broke it into small chunks of 5 or 6 hours of driving with a good rest in between. The driving was effortless, with clear highways and sunny skies, thanks to an unseasonably warm November. Dark comes early this time of year, but we were off the road by 7 or 8 each evening. We ran into one of Mom's cousins, Barry and his wife Barb, in Saskatoon--they were also travelling from the Edmonton area and, by sheer coincidence were staying at the same hotel and eating in the same restaurant! And the next evening, we met up with them again at another cousin's farm. Dianne and her husband Ron hosted us to an amazing supper and a glass or two of wine before we toddled down the road to Brandon for the night. We arrived in Brandon very late and got some sleep before we went to visit with my Aunt Muriel. My cousins Christine and Brian were there as well, so there was much family catching up to do. All of the arrangements had been taken care of by an amazing array of friends and neighbors, food was delivered in massive quanitities, and people came and went. That trend continued the next day, the day of the actual funeral. Two more of my cousins, Bill and Brenda, travelled out from Winnipeg. My mom's relatives gathered, four generations of Beamishes, Lindsays, Walkers, Talbots, and Falloons. They are a large and very diverse lot. And Uncle Jim had a lot of friends, co-workers, and acquaintances that loved and respected him. There was, in short, a crowd. There were flowers, and hugs, and a lot of strangers' hands to shake (H1N1 be damned!). And a lot of family to get re-acquainted with. They all live in or around Southern Manitoba and I live out here in Alberta--see the comments above regarding the distance. And though the circumstances were sad, I felt a certain joy in seeing these people again. There are a lot of phrases in the English language that apply the language of my craft to familes. We have family ties. Families are close-knit. Our lives are woven together. We are cut from the same cloth. Relatives come from the distaff side of a family. We all have a black sheep in the family. Others are dyed-in-the-wool types. Sometimes, families come unravelled, but we pick up the common threads and carry on. What struck me the most about getting together with my relatives was that common thread. We share a history as well as genetics. We know the old stories, and the scandals, even though they may even have happened before we were born. We know the shape of a nose, or the color of our hair**. We don't see each other for years, but that connection is there. Being a spinner, I recognize a good sturdy thread. Sure, there may be slubs and snarls, but the thread is continuous, and strong. It has survived being stretched in all directions by time and distance. In some places, it has been knit together with another thread, in others it has become a little unravelled. But the thread endures, as good thread should. And being a spinner, I also see that I am working to continue the string by raising my children with the stories, the connections, the values of the family that I came from. There are other new fibres being spun into the thread that is my family. Cousins and second cousins with their families, carrying on the same traditions, passing along the connections. The thread is becoming thinner as our grandparents and parents begin to leave us, but it is still being spun. The thread's length means that perhaps we are spread a little further apart. There may even be a break or two, but at times like this, we tie a knot so the thread can continue. I really don't know for sure where the thread started, though there are numerous family histories, and I certainly don't know where it will end. The point is that the thread exists at all. In this day and age, with family spread far and wide, sometimes we need to stop and remember our common threads. The drive home was not so relaxed. We drove across Saskatchewan in a 13-hour marathon. There was a whirlwind of doctors and yarn shopping in Edmonton, then the usual slog home. So, today, I'm tired. But I have this strong thread that ties my life to the lives of dozens of amazing people. Perhaps even hundreds. I have a thread that will endure long after I am dust, a thread to be dug up and examined by genrations yet to come. I have a thread that is strong enough to endure over centuries, a thread that can stitch up our wounds, a thread that ties us together. I have a family. **The Lindsay family of Southern Manitoba, and their descendants are notorious for their glorious heads of silver hair, acquired at an early age. I felt so at home amongst my generation, not to mention our parents! I thoroughly agree with your insights into family. It is like that when my mom's vast clan get together. The Norwegian cheek bones abound, and either of the two common noses, the Sami or the Caucasian, are evident. I noticed the Northern Lights Super Bulky are on the wheel. 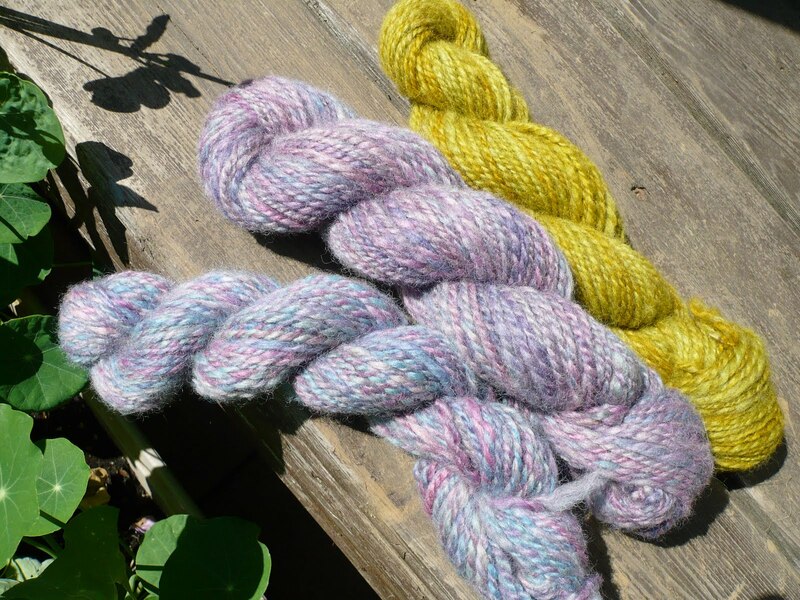 I just spun some up as well, and isn't it almost default spinning? Kathy Sos.